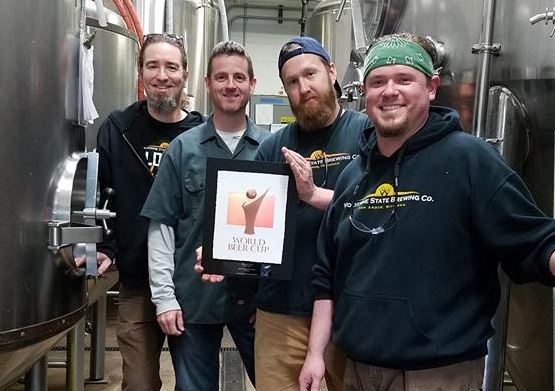 Wolverine's brewing team is no stranger to awards. Wolverine State Brewing Co. is pleased to announce that it has been awarded two medals in this year’s Great American Beer Festival competition: a silver medal for NZ Pils and a bronze medal for Raucher Smoked Lager. Presented by the Brewers Association, the GABF is the largest commercial beer competition in the world and recognizes the most outstanding beers produced in the United States. The medals were awarded on Saturday, September 22, in Denver, Colorado. NZ Pils is a delicate pilsner recipe made with light colored European malts and 100% Nelson Sauvin Hops from New Zealand. The unique light fruit and white wine character of these New Zealand hops helps give this lager a distinguishable hop profile compared to traditional pilsners. The beer was developed by Brewmaster Oliver Roberts in 2017. It is being brewed this week and will be available in the taproom soon. Raucher is a smoked lager built on a base of German Beechwood smoked malt. True to its style, it boasts a balanced profile of smoke, malt sweetness, and hop bitterness. The beer was developed by Brewmaster Oliver Roberts in 2015. It is currently available in the Tap Room. The medals constitute the second and third for Wolverine State in the GABF. Past awards for the brewery include a gold medal at the GABF in 2016, a bronze medal in the World Beer Cup in 2016 and several medals from the World Expo of Beer. That medal count is composed of 23 medals in a wide variety of categories, including a full category sweep of the Euro Malty Lager category in 2018. Gulo Gulo IPL was also named one of DRAFT magazine’s Top 25 Beers of 2013. The Great American Beer Festival takes place every year. This year, over 2,400 breweries entered beers into competition. Of the 8,496 beers entered, 306 were awarded medals. Wolverine State’s medals were two of nine medals awarded to Michigan breweries. Wolverine State Brewing Co. was founded in 2006 by longtime friends and Ann Arborites Matthew Roy and Trevor Thrall. Production began at 2019 W. Stadium in early 2010 under the direction of Brewmaster Oliver Roberts, and the Tap Room opened at that same location later in 2010. Wolverine State, the leader of the Lager Revolution, specializes in creating balanced, unique, and innovative lagers, and boasts a portfolio of more than 200 varieties.